THE TECHNIQUE IS SIMPLE: JUST lay on your back, breathing, and take a complete and negative bodily inventory: “I am not my legs; I am not my feet; I am not my arms;” “I am not my mind;” et al. Now: What’s left after everything else is taken away? This admittedly (and deceptively) simple teaching / exercise comes from Ramana Maharshi, an inadvertent Indian teacher of “Self-realization” whose method I am still just beginning to understand. But it resulted in one of the great spiritual experiences of my life. It’s like this: in the early 2000s, on the sixth night of the Chanukah festival of lights, I was honored to play host in our apartment to a friend of mine and a famous “New Age” rabbi, of whom the friend was a disciple. Knowing of a mutual friend of the rabbi and myself, a filmmaker who wanted me to meet the rabbi, I invited him too. The filmmaker showed up with an Indian friend of his own; imagine our delight and surprise when, upon arrival, the rabbi told us that the filmmaker was his own beloved teacher! The rabbi was scheduled to speak to a small crowd in our apartment, but the only people who showed were the handful I just described, so the anticipated talk turned into an intimate recollection between the rabbi, the filmmaker and the Indian of various Eastern and Western enlightenment-teachers. 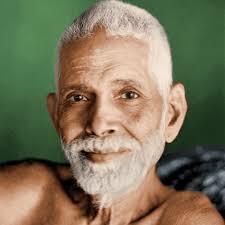 When Ramana’s name was mentioned (I don’t remember by who), the three became very animated and demonstrated Ramana’s awakening-by-negation-of-thought method — a method which, on practicing diligently that night, produced in me the most startling and profound experience. I felt my busy mind drop away to reveal a deep connection to the wordless Source of all consciousness; a perspective of the egoless space between one thought and another; an all-encompassing peace of mind and soul; a vision of the vast and intimate Self beyond the ego, beyond even the apparent separation of one thing from another. Even now, years later, I still can’t adequately describe it. Time has somewhat dulled the experience’s immediacy, but not its effect. It inspired in me a fierce non-dualism (or if you prefer, an undying all-is-One-ism) that remains to this day. And it makes me happy every time I think of it. Thanks, Ramana. I really needed that. …yes. Words aren’t strong enough to bear the experience. YES! YES! Exactly. Thank you for understanding.